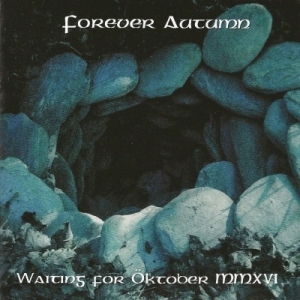 Round these parts, it's no real secret that I'm a convert to "Acoustic Doom", having been blown away by Forever Autumn's 2014 release 'Patience Of ðm Fire-Keeper'. With all of the band's earlier material either lost to digital gremlins, or faded beyond relevance (as discussed in our interview here), the idea of re-recording the 2006 'Waiting For Öktober' album (which finally saw a limited release in '08) has been something I've being eagerly waiting to come to fruition. And now it has, with the 'Waiting For Öktober MMXVI' CD finally available. On paper, it's an interesting combination, retaining the electric guitar contributions of Brian Kulas, from back in the day, adding the cello of Jon McGrath from the current line-up, and using Autumn's own instrumental contributions from both periods, plus a completely re-recorded set of vocals. In practise, this "virtual trio" works well, creating a largely seamless match between the old and the new. There's an occasional vocal or rhythmic hesitancy, though it's questionable whether these arise from the overlap of material - similar minor and organic flaws were also present on 'Patience...', and, as there, they simply fit into the meditative song structures as a part of the natural, intimate atmosphere. That crucial sense of mood on 'Waiting...', even more so than 'Patience...', has a deep confidentiality to it: seemingly more darker and personal in what it shares. Mainly, it's in the nature of the music, with the electric guitar weaving distorted and heavy counterpoint lines through the acoustic elements, its harshly sustained texture sometimes sounding like it could have been inspired by early Skepticism. Though it's used quite sparingly in foreground, it nonetheless adds a doomier weight to proceedings. The rest, though, is in the narration, which is both more prosaic and more revealing: though myth and fable still make appearances, the lyrics largely focus on a desolate and melancholy self-reflection, its fatal finality suggesting Spring has yet to become visible past the cruelty of Winter. Compared to later-written works, seemingly more accepting of the ways in which life and the seasons cycle through death and rebirth, there is little light at the end of this tunnel. Ironically, perhaps, it's exemplified by the wordless, near-19-minute funereal procession of 'Emaciated', with solemn and hypnotically simple minor-chord pluckings broken only by the uncomfortably ragged sounds of breathing that finally close both the album and the lonely ordeal. Almost as bleak are the opening pair of tracks: 'Sound of Snow' - with its snarling guitar a vicious contrast to the plaintive vocal cadence intoning a frozen, solitary death - and the airy, prettily acoustic 'You Cannot Be Cured By Love', that ends with a rust-filled screech of the titular punchline, spine-tingling in its ferocious unexpectedness. Despite its sometimes caustic whispered hoarseness, and the downbeat tune, some faint sense of hopefulness finally emerges from the title track, and 'Ragnarök', complete with coyote-howls and battle-fervour, represents about as upbeat a point as any on the album. The remaining tracks follow similar arcs, with the cello making its most notable appearance on 'Deities Of Sleep', their focus in large part directed by Autumn's ever-changing vocals, ranging from soft and gentle singing to recitative chanting to wild shrieks. And, just as on 'Patience...', the raw emotion and honesty they convey is what really breathes life into the album; their matured range and scope turning the quite minimalistic bardic-campfire compositions into something vital and absorbing, laden with a unique charisma.